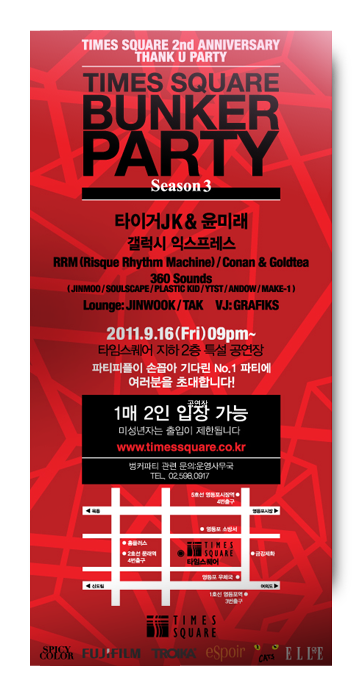 Times Square Mall will hold a 4-day celebration as part of Korea’s biggest mall’s 2nd year anniversary. For it’s Friday celebration, 1000 selected participants will be treated to an exclusive concert. Where: Times Square Mall, via train Line 1, YeongDuengPo stop. Underground exit and follow signs for Times Square Mall. If in doubt, exit towards the front of mall and enter to basement floor (LL2). When: Friday, September 16th starting at 9pm. On the bottom middle part, click off any of the circles. This is just asking how you heard about the party. You will be sent to a new screen asking to sign in. Click the blue button [회원가입]. This will allow you to create a username/password. The next screen will have two buttons in the middle. The left button will be for 14+ nationals. The right button is for foreigners [외국인회원]. Click the right button if you hold a foreign visa of any type. Next screen are just member agreements. Click all boxes. Don’t worry, you’re not selling your soul. Click blue button on the bottom. On the next screen, type your name exactly as is on your ID card (WITHOUT SPACES). Type in your ID # in box 2 (part 1) and box 3. Now at this point, you’ll need a friend to help you if you don’t speak Korean because I cannot go back to this screen since I had membership. However, from memory, I believe it will first ask you to type a username, a 6 unit password (letters and numbers included), email, your Korean address, your house # (type in 02-random 8 numbers if you don’t have one), and then cellphone #. The last line will ask if you would like to receive emails and texts. Click the right buttons if you would like to opt out of this option. Click blue button on bottom to complete sign up. Sign in. Repeat steps 1-3. Repeat step 1 on September 14th to see if you won tickets. Each person gets 2. Note that this sign up process is pretty standard for most Korean sites, so definitely take a lesson from this and apply it to any Korean site where you need to sign up! Good luck and hope to see everyone there!